The Chronicles of Jean Froissart, Philippa de Hainaut and her army, ca. 15th Century CE © Bibliothèque nationale de France, en. IIII.parties vue 342 folio 170. Daughter of William I, Count of Hainaut and Joan of Valois, consort to king Edward III of England. Edward’s mother Isabella of France arranged Edward’s marriage to Philippa of Hainault in payment for the Count of Hainault’s assistance to her in assembling an army to invade England. Queen Philippa was accepted by the English as she refrained from bringing a foreign retinue or large numbers of foreigners with her to the English court and proved to be one of the best loved queens. About 1331, Philippa reflecting on the sources of prosperity which had enriched her own country wrote a letter to John Kempe of Flanders, cloth-weaver in wool, inviting him to England with his servants, apprentices, goods, chattels, and any dryers and fullers who would accompany him to “exercise their mysteries.” She issued letters of protection and gave assistance to their establishment of a new industry in England—manufacturing cloth which would have a major financial impact on England. 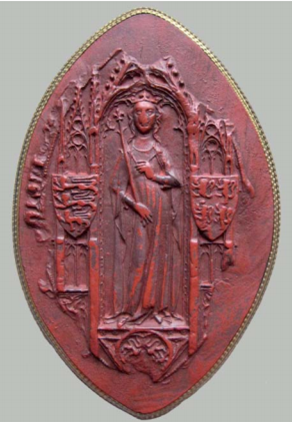 Obverse of the Great Seal of Queen Philippa, Society of Antiquaries, London, seal cast case A1. In 1347, after the year long siege of Calais, king Philip and his army abandoned the citizens of Calais. The citizens agreed to surrender the town and castle if they would be allowed to leave unharmed. Edward declared the limit of his clemency would be that six principal citizens be delivered to him bare footed, halters round their neck bearing the keys of the town and castle. Edward’s commanders reminded him of his reputation for royal clemency and warned against performing an act that might dishonor his name yet he sent for the executioner. Upon that decree pregnant Philippa humbly threw herself on her knees before the him weeping and said “Ah, my dear lord, since I crossed the sea at great danger to myself, you know that I have never asked a single favour from you. But now I ask you in all humility, in the name of the son of the Blessed Mary and by the love you bear me, to have mercy on these six men”. Unable to refuse Philippa he released them to her custody after which she gave them new clothes, an ample dinner and had them safely escorted through the English army to relocate in various towns in Picardy. Edward decided Calais should be repopulated with pure-blooded English issuing an order all people must leave the town. Once back in England thirty-six wealthy and responsible citizens with their families along with another three hundred of lesser standing were sent to repopulate Calais which with the great liberties and privileges the king granted grew quickly. Gee, Loveday Lewes. Women, Art and Patronage from Henry III to Edward III: 1216-1377. Boydell Press, 2002. Jackson, Deirdre. Medieval Women. British Library, 2015.